This is “Cottage A,” one of the three “Old Infirmary” buildings tucked up against the hill under Hillside, the Chancellor’s residence on the UMass Amherst campus. These three cottages were the early infirmary for Mass. Agricultural College, used for that purpose until the new infirmary was built in 1961. 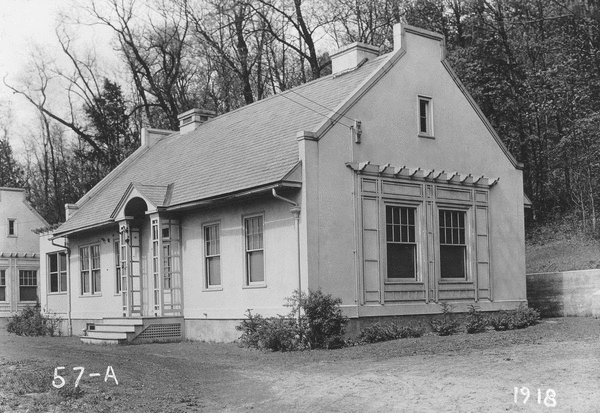 From about 1961 until 1996, Cottage A was the home of the “Bulletin Center,” the publication distribution office of the Cooperative Extension Service and the Massachusetts Agricultural Experiment Station. The three buildings were sometimes known as the “music cottages” because Cottages B and C were used as practice rooms for the Department of Music and Dance after 1961. The cottages were razed in late 1996. The Life Sciences Laboratory now stands on the site. Courtesy Special Collections and University Archives of the W.E.B. Du Bois Library at UMass Amherst.